A delegation of UK based MBA students studying at Cass Business School, City University London, has met with some of the UAE’s most prominent business figures and toured a number of leading companies, to better understand the challenges and opportunities facing key growth sectors in the country. Dubai’s transition from oil and gas dependency to a tourism, trade and transportation led economy was a major theme, as was Abu Dhabi’s ongoing management of its oil revenues, its plans for energy diversification and sustainable development, and market entry techniques and expansion potential for international companies interested in operating in the Gulf region. 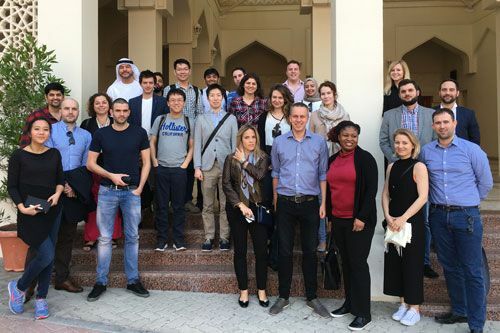 For the seventh year, the UAE study tour, led by Roy Batchelor, Professor of Banking and Finance, and the Executive MBA Dubai Course Director, visited both Dubai and Abu Dhabi. It featured trips to flagship companies across a range of sectors, including conventional and renewable energy, conventional and Islamic finance, real estate development, retailing, design, hospitality, sports, shipping and trade, telecommunications and infrastructure. During the five-day tour, the students met with Mubadala Development Authority, Emirates National Oil Company, DP World, the Masdar Institute of Science and Technology, Dubai Design District, Emirates Airlines, JWT, and Nakheel. The MBA students were also given an overview of DIFC, where City University London’s Dubai Centre is located, by Margit Levay, Assistant Vice President - Institutional Partnerships, DIFC. Following this, Saeed Kharbah, Head of Strategy and Planning, Dubai Islamic Economy Development Centre provided his unique insights into the Islamic Economy and the industry in the UAE. Finally, Matthew Lewis, Partner - Middle East and Africa, from Boyden Global Executive Search spoke with the students on understanding the Gulf executive talent marketplace. In addition to in-depth industry sessions, the visit also enabled insights into local customs and culture, through a trip to The Sheikh Mohammed Centre for Cultural Understanding, the Abu Dhabi Grand Mosque, Alserkal Cultural Foundation Heritage House, a desert safari and a list to the top of the iconic Burj Khalifa, the world’s tallest building.